"Sentinal" redirects here. For the another sedan officially known as the "Sentinel", see Sentinel article. A Kuruma in GTA III. The Kuruma is a four-door sedan seen in Grand Theft Auto III and Grand Theft Auto: Liberty City Stories. It becomes a tuner vehicle in Grand Theft Auto V.
The word "kuruma" means "automobile" in Japanese (車), which may suggest that the car is of Japanese origin. However, the car is loosely based on a 1998–2004 Dodge Intrepid, and a 2001–2003 Chrysler Sebring. There also appears to be resemblances of the Rover 45 (2004–2005), particularly the rear. For GTA Liberty City Stories, the Kuruma has slight cosmetic changes to make it look like a generic Japanese sedan during the late 1990s, the front appearing to resemble a 1994–1997 Honda Accord, and the taillights from a Opel/Vauxhall/Holden/Chevrolet Vectra C; it also comes with coloured or uncoloured (gray) bumpers and trims, giving it the appearance of an economy car. 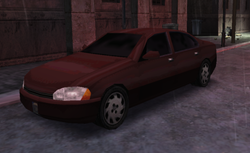 The Kuruma is the first car made available to the player in both GTA III and GTA Liberty City Stories, in the missions "Give Me Liberty" and "Home Sweet Home", respectively, probably due to the fact that it handles relatively neutrally. When originally introduced in GTA III, the car is not seen driven on the streets of Portland, but is parked in various locations in the island; in GTA Liberty City Stories, the car is present in Portland traffic. During development of GTA III, the Kuruma was originally known as the "Sentinal", not to be confused by the Sentinel, another sedan in the final version of the same game, in which it was previously known as the "Beamer" during development. Prior to the game's release, the Kuruma is presumed to have been renamed, while the "Sentinal" name found its way into the Beamer, resulting in the Beamer being renamed the "Sentinel". The Kuruma, now branded by Karin, has been redesigned to be a 4-door tuner, in a similar vein to the Sultan. It mostly resembles the Mitsubishi Lancer Evolution. The Kuruma as the "Sentinal" during development of GTA III. GTA Liberty City Stories (Rear quarter view, with grey bumpers). The Kuruma is powered by a small, yet gutsy, engine (most likely a four-cylinder) channelled to the front wheels. While the engine is powerful enough to propel the Kuruma to high straight line speeds, the front-wheel-drive layout causes understeer. Players may therefore favor using the handbrake to swing round turns at high speed. The car has a stiff suspension set-up that compromises stability when going over bumps and rough ends at high speeds. For a mid-size or compact sedan, the Kuruma is relatively heavy for its class, weighing in at 1,500 kilograms. This heavy curb weight hampers acceleration and causes the Kuruma to drive sluggishly. Crash deformation and braking are acceptable, but not excellent. The Kuruma possesses almost identical handling properties to the GTA III rendition of the Taxi. The FBI Car in GTA III is a Kuruma-based law enforcement sedan for use by FBI agents, prominently painted black and features a higher ride height as well as a blue dashboard-mounted strobe light. Manhunt's rendition of the Kuruma, as a wreck. Manhunt 2's rendition of the Kuruma. 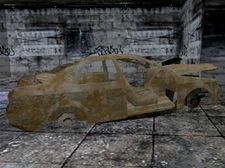 The Kuruma has appeared as both a wreck and a working car in Manhunt and Manhunt 2, respectively. The Kuruma is referenced in an episode of CBS crime drama "NCIS" where a witness tells Ziva David that the getaway car was a "Kuruma", who gets told by her superior Agent Gibbs that "kuruma" means car, and that her description of the car is car. Agent McGee steps in and tells his confused co-workers, "Kuruma is the name of a car in Grand Theft Auto III, it's a Chrysler Sebring Sedan, boss." Head Radio Studio, Hepburn Heights, Portland. Greasy Joe's Café, Callahan Point, Portland. Parking lot of the Docks, Portland Harbor, Portland. Momma's Restaurant, Saint Mark's, Portland. Liberty Tree parking lot, Bedford Point, Staunton Island. Carson General Hospital, Rockford, Staunton Island. AmCo Headquarters, Torrington, Staunton Island. In a car park, near the apartments, in Wichita Gardens, Shoreside Vale. In the Multi-Storey Car Park, Staunton Island. Driven around Staunton Island and Shoreside Vale. Parked outside Vincenzo's warehouse in Atlantic Quays, Portland. The car is uniquely black. In Saint Mark's, parked where you dropped off the drugs for Salvatore from the Cartel in the mission Contra-Banned. Spawns regularly on all three islands. Easy Credit Autos, Harwood, Portland. This page was last modified on 10 April 2015, at 02:00.